How to make Shabbat your family's favorite day of the week. Preparing for and celebrating Shabbat can be a daunting proposition. There are so many things to do even just to prepare, and if you have children, the prospect of celebrating Shabbat (meant to be joyous and relaxing) for even one hour, let alone 25, can seem preposterous. Don’t give up. This day-long marathon can be packed with marvelous family traditions and special opportunities for fun. 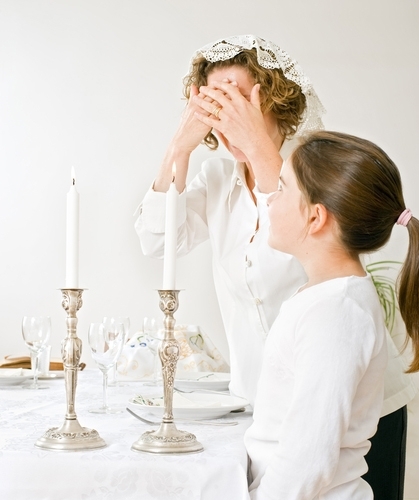 Instead of making a radical change in the way your family observes Shabbat, make it gradual. Try some of these tips below and make Shabbat a truly special day for your family. Cooking has been at the center of preparation for Shabbat for generations. For traditional Jews, who do not prepare food during the Sabbath, all meals must be prepared before candle lighting. Sometimes cooking for Shabbat seems totally overwhelming–even for those who are only preparing one meal. Relax! Shabbat meals are family meals where something is different and special. But this doesn’t mean that they have to be fancy. Instead of laboring, pick up a barbequed chicken and a few side-dishes from your local kosher market, or make something simple. If there’s time, encourage your children to help choose the menu or prepare the meal by making salads, chopping vegetables or helping to make dessert. Shabbat is a unique time of the week. For many families, it’s the time when the white table cloth comes out, when Great-Grandma’s silver candlesticks are polished and used for lighting candles, and when the entire family drinks out of goblets instead of glasses. Add to the atmosphere by using your finest china, silver and crystal (those lovely things that never seem to get used), and a lovely tablecloth. Pick up flowers on the way home. Open a bottle of wine to have with dinner, not just for kiddush. Set the table in advance so that everyone gets to enjoy the anticipation of the family meal. Invite another family over to join you, or other members of your family. Make sure that the kids participate by setting the table and making table decorations or place cards. The weekly ritual of a “fancy” dinner, even if the food is less than fancy, will make for great memories. The ambiance will make the entire experience worthwhile. In some homes, families have established a custom of emptying their pockets and putting a few coins in a jar before the beginning of Shabbat. This helps individuals to remember that Shabbat is a taste of the world to come, in which there will be no poverty or illness, and that we must help achieve this in our world by giving tzedakah. Some families like to put a small jar or tzedakah box near their Shabbat candles and give a little bit each week before they light candles. For many years, the lighting of Shabbat candles was a woman’s domain. Today, this ritual can include whoever chooses to light candles. In some homes, there are two candlesticks lit, symbolizing each parent, and many smaller candles lit for each child and each guest. Make your candle lighting special by adding a candle for each child and lighting them all together as a family. The rituals of the Shabbat table are perhaps the most beautiful and family friendly of the entire Jewish year. Take out all the kiddush cups and give one to each person, or even use nice goblets. At the end, clink the glasses in a celebratory “l’hayim.” Since hallah is always a welcome treat, make it even more delicious by extending the Rosh HaShanah tradition to a year round one and dip your hallah in honey. And top it all off by taking one cloth napkin and decorating it as a family to use as your hallah cover. One of the greatest treats for children and parents are the series of family blessings that are recited before dinner. Jewish tradition provides us with two blessings–one for boys and one for girls–which invoke our ancestors’ merits and allow us to pray for God’s blessing for our children. Parents lay their hands on their child’s head or shoulders, and recite the following blessings. (boys) May God make you like Efraim and Menashe. Yisimha Elohim k’Efraim ukhiM’nashe. (girls) May God make you like Sarah, Rebecca, Rachel and Leah. Yisimeih Elohim k’Sarah, Rivkah, Rahel v’Leah. Following these blessings, parents customarily recite the priestly blessing, Birkat HaCohanim. If you’d like to give your child a role in this blessing, invite them to put their hands on your head, and give you the blessing of Birkat HaCohanim as you recite it together. Many congregations are recognizing that small children, too, can be welcomed into the synagogue to celebrate Shabbat, and are adding special tot or family services on Friday evening and Shabbat morning. These services are generally shorter, with a story instead of a sermon, and feature songs and melodies that appeal to children. When something is child-friendly, it’s naturally parent-friendly; parents have the opportunity to get into the mood for Shabbat with their children, instead of being solely responsible for setting the tone. Families who go to services together enjoy the celebration of Shabbat together, and with their community as well, and the expectation that Shabbat is family time becomes an honored family tradition. Many families enjoy adding to the beauty of Shabbat by singing songs after the meal. Traditional songs dwell on the theme of Shabbat, the different rituals, blessings, services, prayers, or on the spiritual nature of Shabbat and the delight that Shabbat provides for us. The Talmud mentions that it was the custom to sing songs of praise during the Shabbat meal (Megillah 12b), but there is no particular list of songs. Each family can choose the songs they’d like to sing to make the Shabbat experience more joyous. Many families choose to sing Jewish songs, but others sing special family songs during this time instead. For more on Shabbat songs, including videos and lyrics of popular ones, click here. Because on Shabbat we often have the time to spend an extended evening together as a family, bedtimes may be later. Add something special to your bedtime ritual by reading or telling a special Shabbat story: check out your local bookstore for many outstanding titles perfect for children. Also choose a special Shabbat song to sing, like Bim Bom, Lekha Dodi or Shabbat HaMalka. A friend of mine many years ago introduced me to the idea of Shabbat cereal. Day after day, we eat healthy breakfasts–nutritious cereals, waffles or pancakes, eggs, etc. On Shabbat, take a break from the nutritious stuff and bring out the Shabbat cereal. Sugared cereals make the breakfast before attending services a bit more special, and definitely distinguish Shabbat breakfast from breakfast during the week. For generations, the Shabbat afternoon nap has been a grown-up favorite–it’s the one time during the week when a nap is actually possible and permitted for adults. Make naps something to look forward to: families nap together. One of the key values connected to the celebration of Shabbat is that of menuha, rest. Take some time with your children for cuddling or resting with a favorite stuffed animal or book in bed. Make a special rule that parent nap time is always enforced for one hour in the afternoon, and that kids can play quietly while their parents nap. Kids can tuck their parents into bed and wake them up after an hour! In addition to the nap, the idea of Shabbat menuha also extends to work. Shabbat should be a day when kids are freed from their chores and their own responsibilities. Let it be a day off for everyone. The ritual which ends the relaxation of Shabbat and begins the work-week is the most child-friendly of all. Havdalah, or “separation,” lasts for a mere five minutes, and includes blessings that appeal to the senses. The short blessings are perfect for little ones to hear and say, and it’s always a treat to watch the candle burn and sniff the delicious spices before we taste the wine. Saying goodbye to Shabbat together also allows you to help set the tone for anticipating the coming of next Shabbat. Instead of Shabbat being a day of “no,” make it a day of “yes.” Yes, have fun as a family. Yes, provide kids with lots of roles and responsibilities. Yes, enjoy special treats for young and old alike. Try some of these ways to make Shabbat fun for children of all ages, and it just might become your favorite day of the week. Pronounced: tzuh-DAH-kuh box, Box or receptacle used to collect and store charitable donations. Also known as a pushke.